Tone Machines Blog: Tone Machine Anyone? 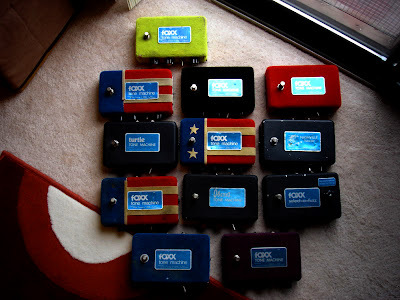 This mondo buffet of fOXX Tone Machines comes to us from our good friend Gino out of Chi-Town. In an earlier post we got deep inside the single Tone Machine I own and mentioned all of the cool other brands and colors it came in. Now you can see for yourself! I especially like the American Flag ones, which are among the rarest of the rare. Your blog is an inspiration to me and your photos are amazing.